Ascott Raffles Place ~ My first staycation post! 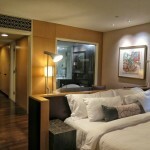 The service apartment is great for people travelling to Singapore for business trip or leisure. It is also suitable for locals to have a short getaway from their homes. I always love travelling and when I can't travel, a staycation is also good to recharge myself and keep my mind away from the hectic work.